Once upon a time, there was a feather. This feather was floating through the air and wanted to find meaning to life. It asked the heavens why it was always floating. Then one day, the wind stopped. The feather fell into a pond. As it floated down a stream, it approached a waterfall. The feather wondered what would happen if it would sink. It had been tired of floating. The feather asked the heavens for the ability to sink. Then it hailed. The hail-storm caused chunks of ice to land on the feather. The feather gained weight and sunk as it fell down the waterfall. When it reached the bottom of the ocean, it spotted fish swimming. Then one fish stopped to look at the feather covered in ice. The fish asked the feather to swim with it. The feather said it could only sink because of the weight of the ice and it would float if the ice was removed. 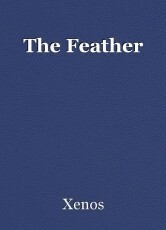 The feather asked the heavens for the chance to swim. The heavens gave the ocean a current. The current separated the fish from the feather. The feather was alone and was about to ask for company but, the feather was beginning to wonder why it always gained more desires after it received what it had asked for. The feather was tired of wanting more and asked the heavens return it back to its original position. It said “I would rather float through the skies and think about life than to want more for my life.” The current removed the ice from the feather. The feather floated above the water and a breeze carried it back into the skies. The rain had stopped and all the feather could see was a beautiful rainbow. “Oh, how I love the ways things are.” Said the feather. The feather continued floating and appreciating life’s beauty from the skies where it remained. The end. In a world where everything is living and death is non-existent, nobody appreciates life. There was a feather that was the color of a rainbow. It would tell stories to pass idle time. Nothing could die, but everything could be born. “Soon this world will fall. With so many things being born and nothing fading from existence, we won’t have room to live on this planet anymore.” Said the feather. “We should learn how to fly and go to another. An oak tree overheard this thought and told the feather, “..but things can be destroyed. I’ve seen it happen.” The feather disagreed. “But when will I be destroyed? I am living and seeing nothing new. Nothing wants to change and everything stays this way.” The oak tree replied, “If we change, we will regret the past. I am an oak tree. I have changed once and now I am forced to live this way. Once when I was just a sprout, I could look up at the sky. It was beautiful seeing the colors change from blue to black to orange and sometimes black. I could spot stars and clouds. Shapes and animals were always catching my eye. Then one day I grew into a tree. My branches grew leaves that covered my vision. I can no longer see the sky, but you’re a feather. If you change, the wind won’t carry you.” The feather asked, “Why would I become after a feather?” Then the wind carried the feather away from the oak tree. The feather flew towards a pond and met a frog. “Hello frog.” The frog said, “Ribbitello Ms. Feather. And what brings you to my tiny pond?” The feather said, “The breeze carried me away from the old oak tree. It knows the answer to life and I must return back to it. Please guide me back to the forest Mr. Frog.” The frog pointed down a stream where a waterfall was. “If you want to return whist you came, you must float down that stream. The forest should be at the bottom of the waterfall, but be careful. There will be a storm tonight.” The feather said, “I do not die. I am a feather. I just want to change.” The frog became startled. “But if you change…” The feather interrupted the frog. “No! Nonsense! You are no oak tree. You are a frog! Do not waste your breath on me.” The frog lept away after pushing the feather down the stream. The feather was almost to the waterfall when the clouds turned grey. “Oh no! I will sink if a storm appears! I must get back to the oak tree!” Hail started falling from the skies and trapped the feather underwater. The feather was at the edge of the waterfall and was passed by many fish. “Help!” One fish stopped by the feather and ask, “Why are you underwater? You’re a feather.” The feather asked the fish to push it down the waterfall. “I can not move and I need to get back to the oak tree to find the meaning of life. I need to change.” The fish said, “I don’t think a feather can change. But even if it could…” The feather interrupted the fish. “I WILL NOT TOLERATE A SHELLFISH LIAR!! Hurry and send me away! This ice has paralyzed me!” The fish was irritated and pushed the feather down the waterfall. “You will only find sorrow if you continue to seek change.” The fish yelled as the feather fell. If I Go To Hell, Will You Meet Me There?